“My concept is based around urban agro-ecology which looks at reintroducing more ‘natural’ ecosystems into cities. I’m designing a system that converts food waste in the home into good quality soil using the lifecycle of the black soldier fly. 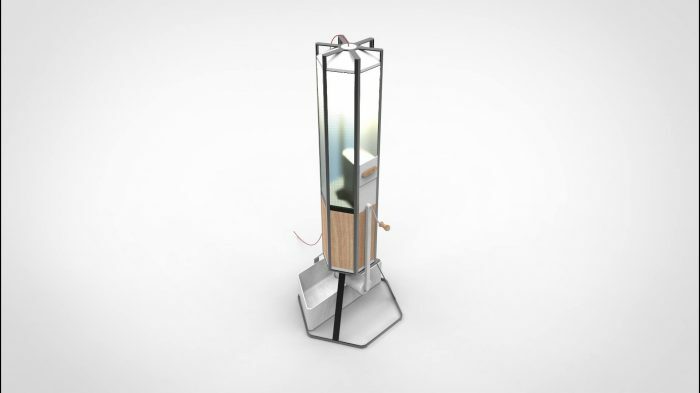 The unit blends food waste to feed larvae in a lower vessel that very efficiently convert the waste into soil that can be extracted from the unit that sits below a tall light that houses the flies during the breeding phase of there lives. The light simulates the right climate for the flies to breed. The hatch opens to a shredder that blends the food waste increasing the surface area for the organisms to convert the waste. The wooden vessel below houses the larvae and the compost. The handle is turned to extract the soil form the base into the pot provided. The idea is that the unit will work as a self sustaining ecosystem where the flies provide a natural alternative to wasting food. This entry was posted in Design and craft, Graduate Show, Graduates 2017, Product design, Undergraduate and tagged agro-ecology, black soldier fly, ecosystems, product design, soil quality, sustainability.